Are you an avid conservation biologist or have done recent studies related to conservation biology? 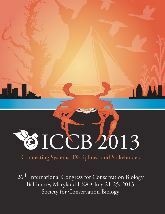 If your answer is yes, then you should check out the 26th International Congress for Conservation Biology sponsored by the Society for Conservation Biology (SCB) to be held July 21-25, 2013 in Baltimore, Maryland, USA. Abstracts of proposals are currently being accepted until January 30, 2013. The theme for this year’s meeting is Connecting systems, disciplines, and stakeholders. The SCB also sponsors Student Award Candidates and a Mentoring Program for students interested in participating in the meeting.